"Good service and genuine product"
Many thanks for your positive feedback. We look forward to serve you even better in future! 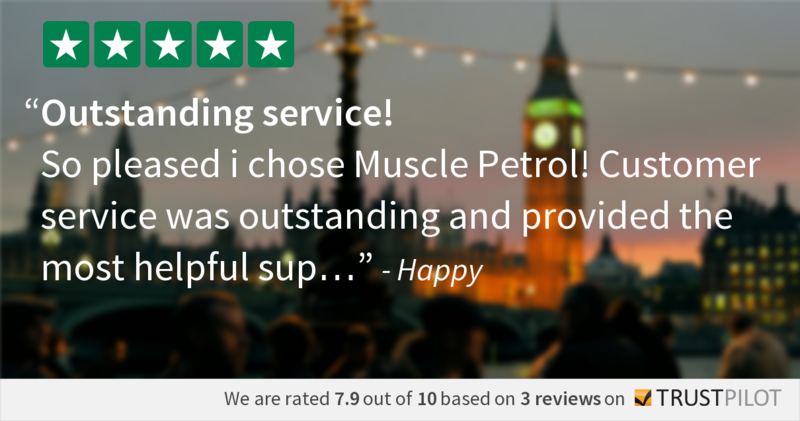 "Great deal 2 for 65 and fast delivery; Keep it up Muscle Petrol." "Is what it says it is. Will be using again without a doubt!" "Very good product and very fast delivery! Love the taste." "Awesome product, awesome service A+++"
Bounty Protein Bars - Just awesome! "Awesome taste and best quality and service delivery with a lot better prices I can find here." "Tastes nice and mixes really well.."
"Use this a lot works for me, helps build muscle very quick." "I really like the effects of this powder, but it kind of made me feel sick after using it for a few weeks. I was also drinking tons of water to reduce the bloating that people always talk about so that could potentially be why. I could have been flushing important vitamins and minerals from my body. I finally just stopped taking it, but I really like that this powder was so fine, mixed well in a shaker, and was tasteless. It does have a gritty texture on your teeth afterwards, but goes down smooth. I think this powder is great and I might try it again because it did make my muscles look fuller and I felt great during workouts. It was just my stomach didn't like it." "Always go back to this as a regular user of glutamine , the quality and fineness of the powder is second to none , I highly recommend this make , only used other makes since we all the same never sticking to what you know , lesson learned for me now I hope :)"
"Better than mounds or almond joy."